A lame remake of The Front Page and His Girl Friday, Switching Channels is dull, uninspired, and singularly lacking in wit and chemistry. 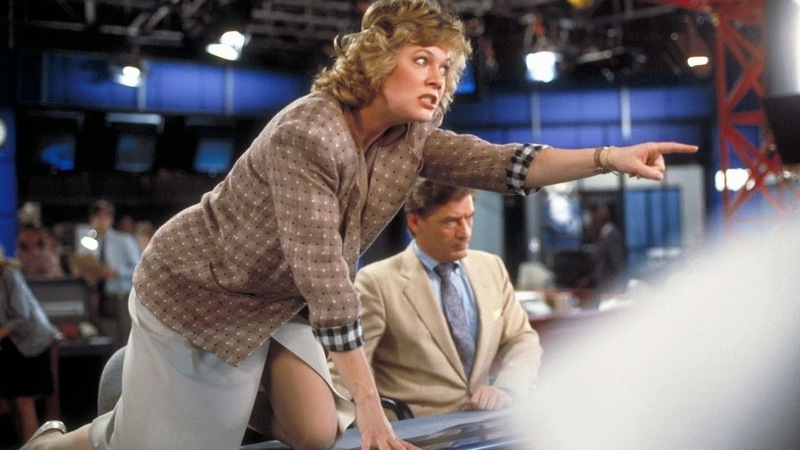 Christy Colleran (Kathleen Turner) is the star anchor at the Chicago-based Satellite News Network, where her ex-husband John "Sully" Sullivan (Burt Reynolds) is the station director. When an overworked Christy finally reaches the point of exhaustion, she is packed off on a forced vacation, where she meets and falls in love with smooth businessman Blaine Bingham (Christopher Reeve). Christy returns to Chicago on a high, announcing that she is quitting the news business and marrying Blaine. Sully does not want to lose his star on-air talent, and he still harbours hopes of winning back Christy. He proceeds to conjure up every possible obstacle to place in the way of Blaine, while tempting Christy back to her career by getting her to interview Ike Roscoe (Henry Gibson), a death-row inmate about to be executed for killing a drug-dealing cop, in the hopes that the exposure will force the Governor to issue a pardon. Meanwhile, Attorney General Roy Ridnitz (Ned Beatty) is himself running for Governor, and wants to make sure that Roscoe fries to further his own tough-on-crime credentials. The fourth big screen version of the Broadway comedy The Front Page by Ben Hecht and Charles MacArthur, Switching Channels is as unnecessary as it is awful. With pedestrian direction by Ted Kotcheff and a juvenile Jonathan Reynolds script, the film attempts to modernize the premise to the world of television, but has a dreadful time trying to find laughs, and fails miserably at every opportunity. Burt Reynolds' performance is simply annoying, while Kathleen Turner is off the mark, seemingly over-acting in desperation to appear either witty or ditzy, but instead coming across as fatally bland. Reynolds and Turner together never threaten to display any sign of a spark, and indeed are reported to have clashed throughout filming. Christopher Reeve suffers the most, his Blaine Bingham a phantom personality, stood up as an easy cardboard target for Sully's darts. The film ends with that time-trampled old favourite from the films of yesteryear, herds of men running in groups in and out of rooms and across hallways, lowest common denominator comedy that pre-teens may find funny, but really just serving as an embarrassing confirmation that some comic elements are best left in their own era. Switching Channels clumsily fumbles with the dials, but only manages to find aggravating static.